Our fantastic chicken products are available throughout all of Ireland and UK in both the retail and foodservice sectors. We supply a host of independent retailers, local food shops, butchers’ shops, and symbol groups. You will find our chicken on some of the finest restaurant and hotel menus in the land, cooked by chefs who appreciate great ingredients, produced honestly and with the extra provenance they require. You will also find our chicken in cafes, take aways and chip shops run by very discerning people!! Simon Dougan of the Yellow Door Deli says…. 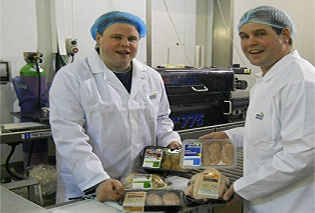 “Rockvale chicken is a fantastic product, produced right on my doorstep in Co.Armagh. Since the birds are air chilled they have lovely dry skin which crisps up beautifully……these guys really care about what they do, and it shows”. Our products are supplied in larger quantities to various wholesalers and manufacturers nationally. For commercial sales enquiries, please contact Marcus or John Click Here.